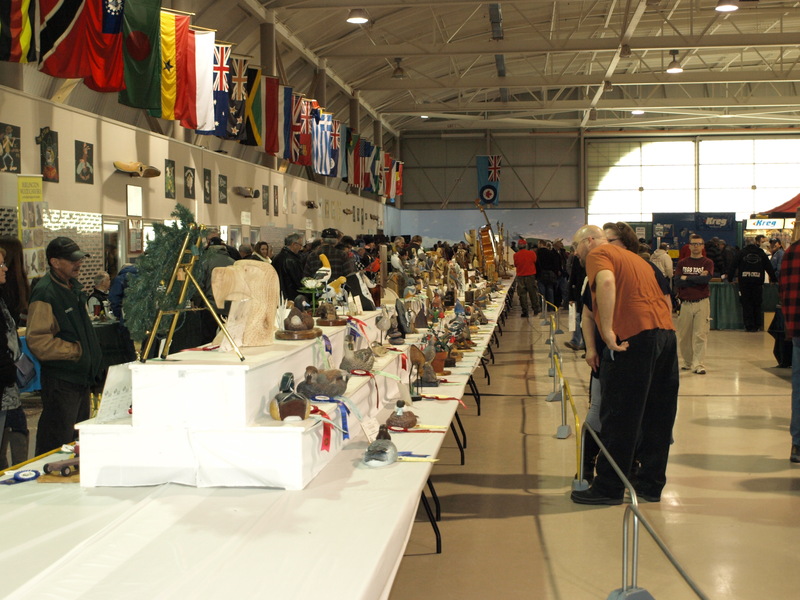 The Canadian Carving Show was held again this year in Hamilton, Ontario at the War Heritage Museum adjacent to the International Airport. Again, my daughter, Emily, and I were able to get together for a day to take in the show and also enjoy a visit to our favourite Indian restaurant and a bit of a shopping spree at IKEA. A lot of fun. We attended together on Saturday, and I returned on Sunday to take in more of the show. 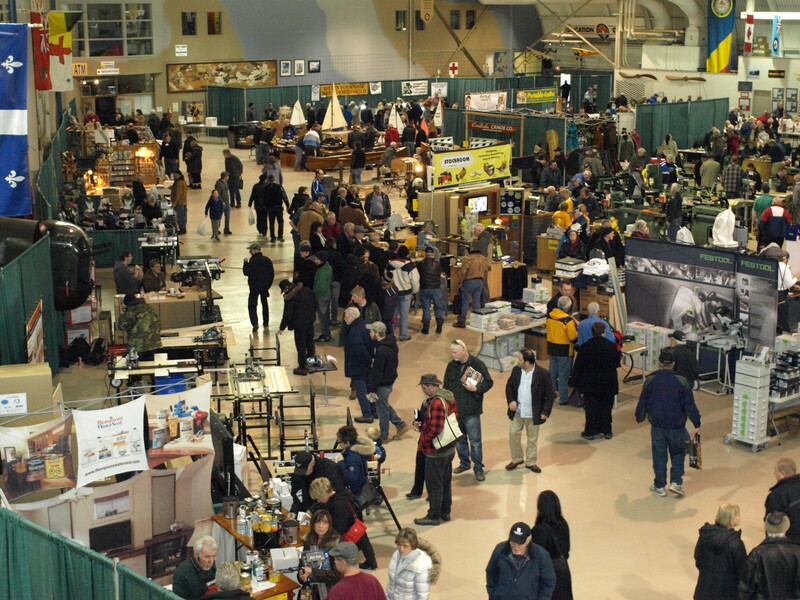 The event was very well attended in spite of some extreme snow and ice conditions that hampered travel that weekend. 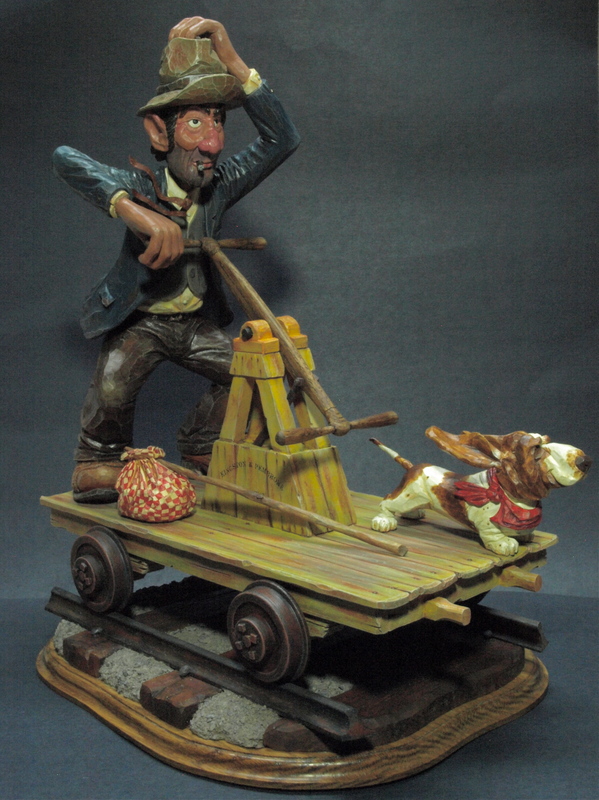 Being a combination of wood-working and wood-carving, the show attracted in a lot of suppliers and craftspeople with common interests. There were some very good deals to be had on supplies and equipment as well as some excellent demonstrations to take in. The museum was also available to all wood show participants, and Emily and I made good use of that. 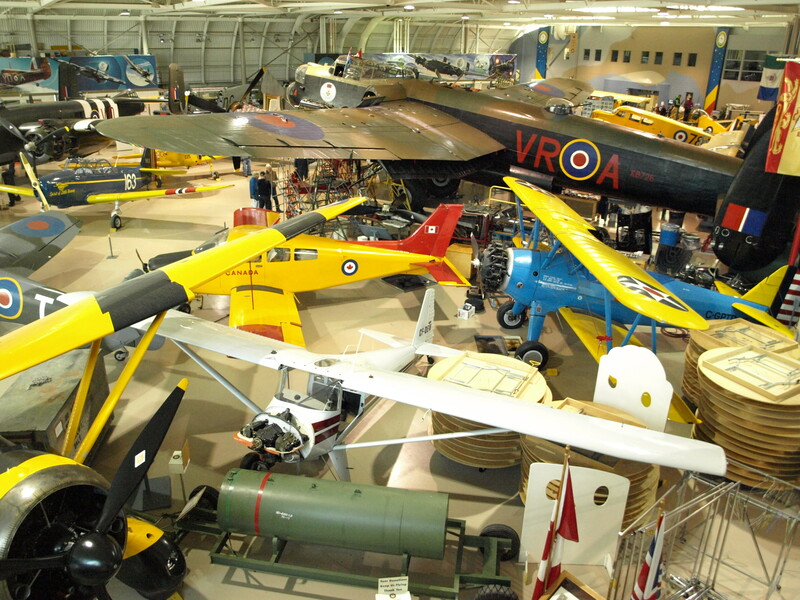 95% of the aircraft, of which only a few are shown in the photo below, are airworthy. I believe that the Lancaster, shown here, is one of only two airworthy Lancasters left in the world. 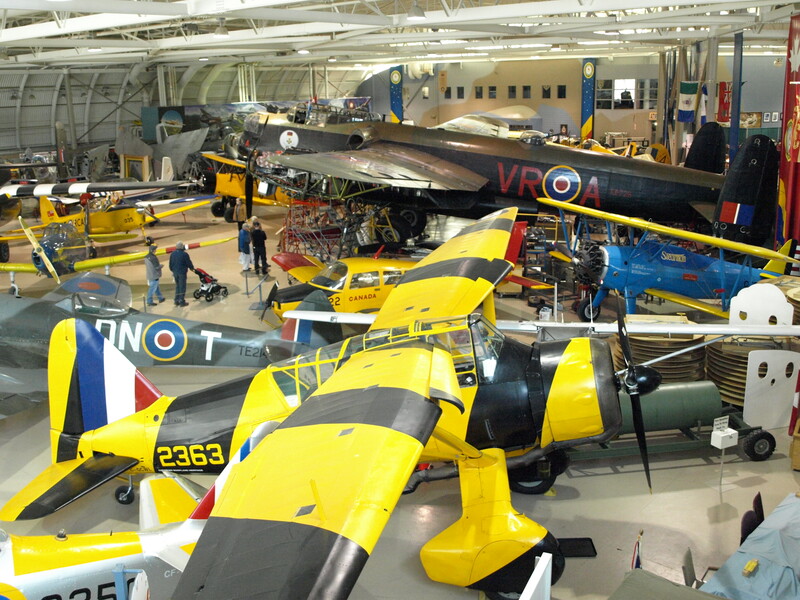 I know that I’ve seen this Lanc fly overhead several times when I’ve visited my hometown of Niagara Falls. 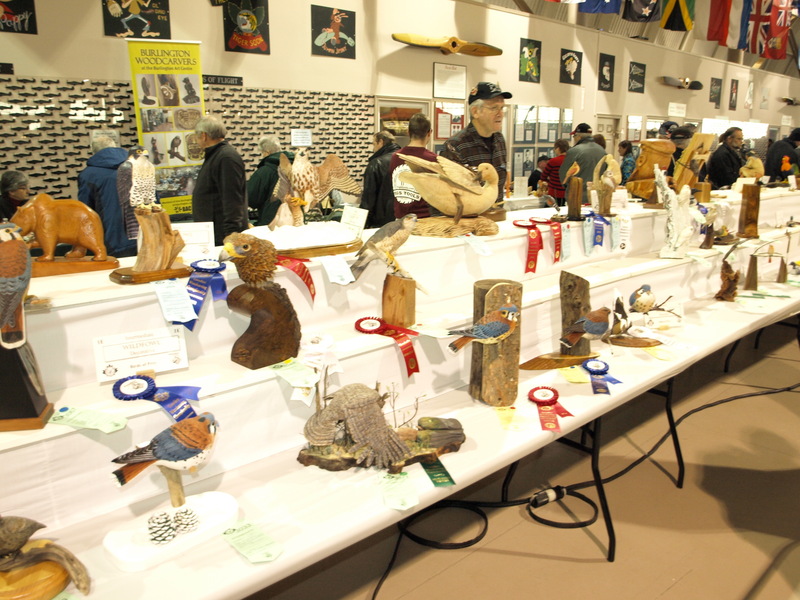 I’m not exactly sure how many carvers brought carvings to the show…but, there were a lot of beautifully crafted items in all categories. I wish that I had recorded the individual’s name, but, one craftsman brought a cello that he had made. 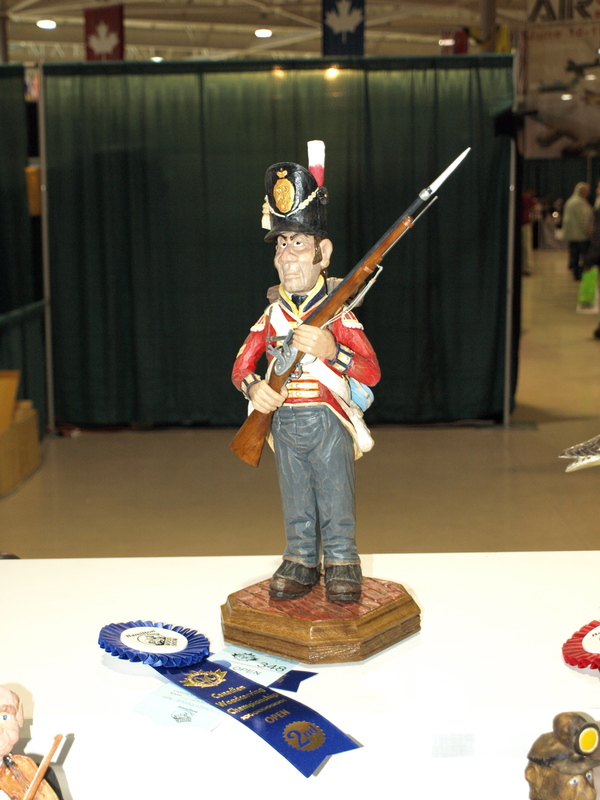 Corporal Duncan Sowerby was awarded 2nd in Open Caricatures and proudly stood next to many exceptional carvings in the caricatures category. 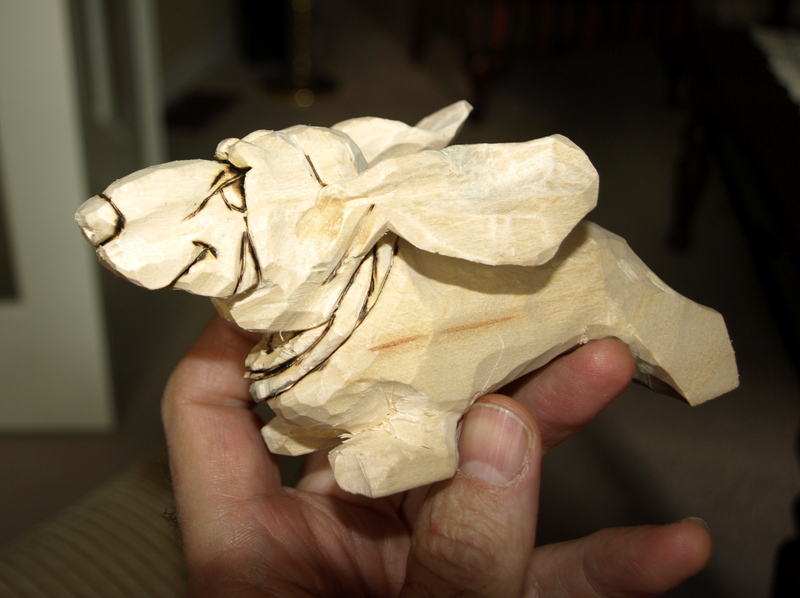 I also got a chance to talk with a number of caricature carvers who brought great carvings. A couple of photos of some of the carvings are included below, but several more are on the Flickr Site that you can link to at the side of this page. 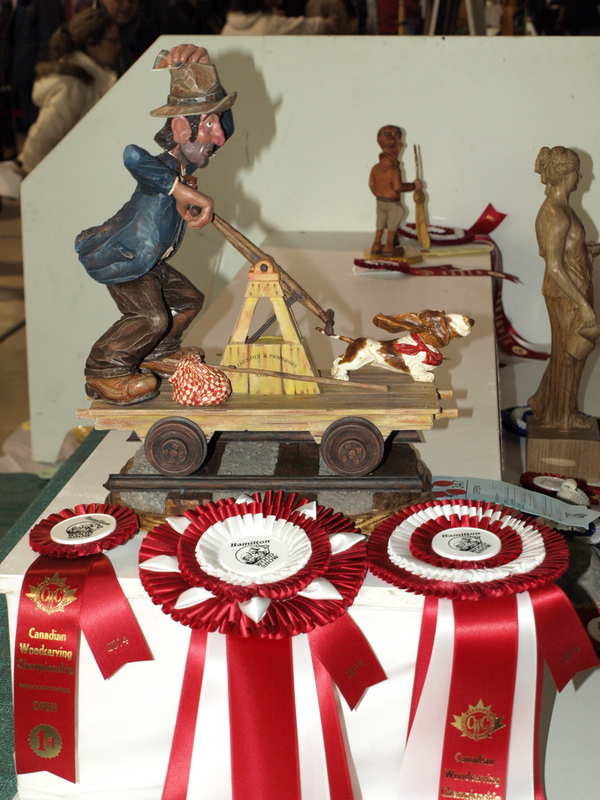 Although I’ve been very proud of my “Hobo and Ned” carving, I can tell you that Emily’s and my jaw dropped when we saw that the judges awarded it 1st in Open Caricatures, 1st in Open, and, 1st Best in Show. What a thrill and what a memory. Be sure to attend this outstanding event next year. 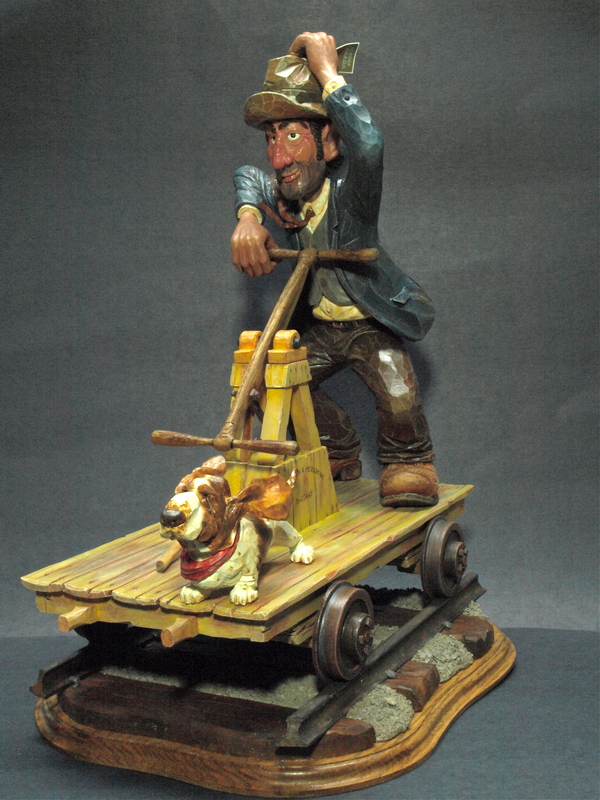 Hobo and Ned are on the Rail! Yes…I can hardly believe it either…this project has come to a close! 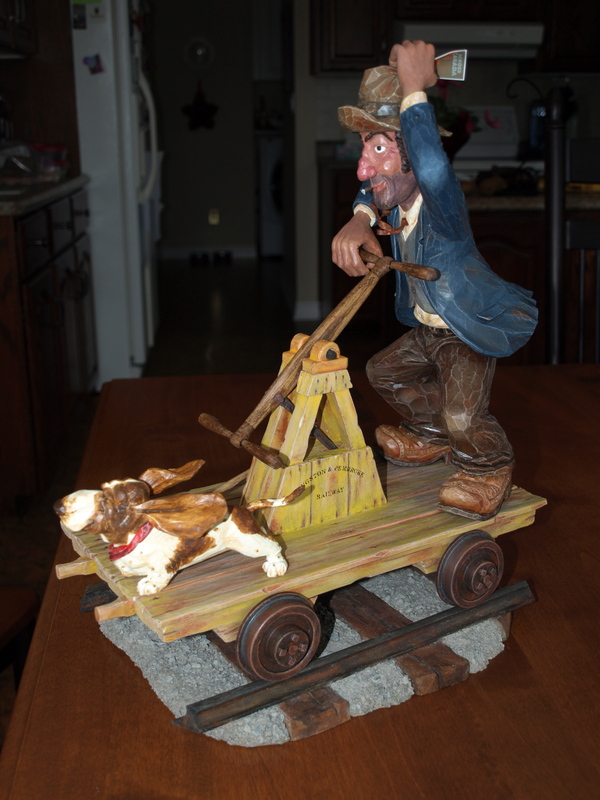 I’m very pleased with the way this carving has turned out and I sure did enjoy every minute of the carving and painting. 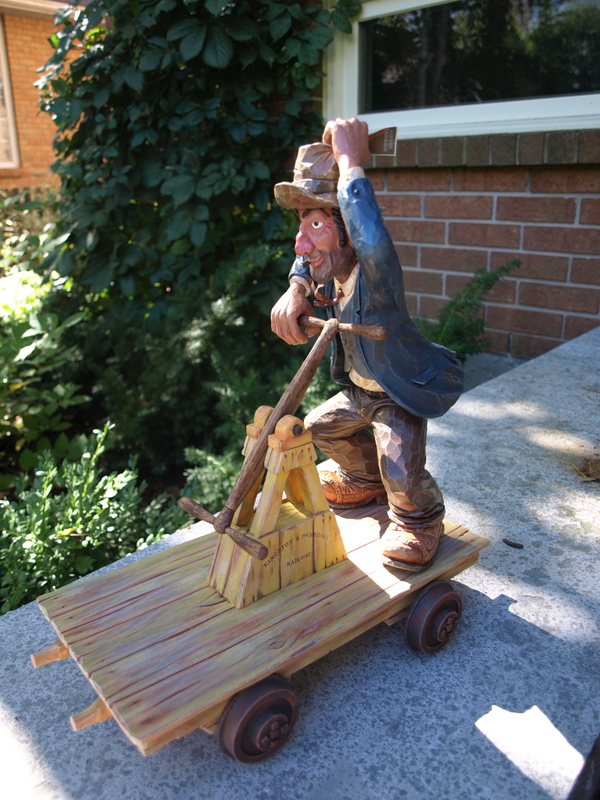 I’m headed to the Hamilton Carving Show at the end of this month and am really looking forward to showing it to other carvers. 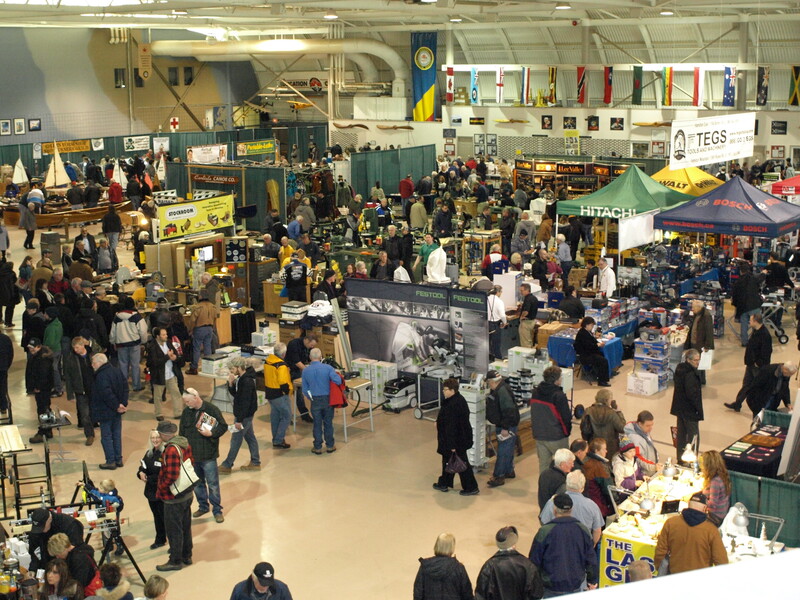 The Hamilton Show is a Canadian woodcarving competition and is combined with an equally outstanding woodworking show as well as a top-notch Heritage Warplane Museum. If you are within travelling distance, this show is well worth attending. My daughter is also joining me and I’m looking forward to spending the day with her. Enjoy the photos! There are more on the Flickr Photo link at the side of this page. Happy New Year! Just think…a whole new year for imagining new projects. Well, I’m ( finally ) at the point where everything is as finished as it’s going to be and I’m starting to place and position things together for the final gluing. 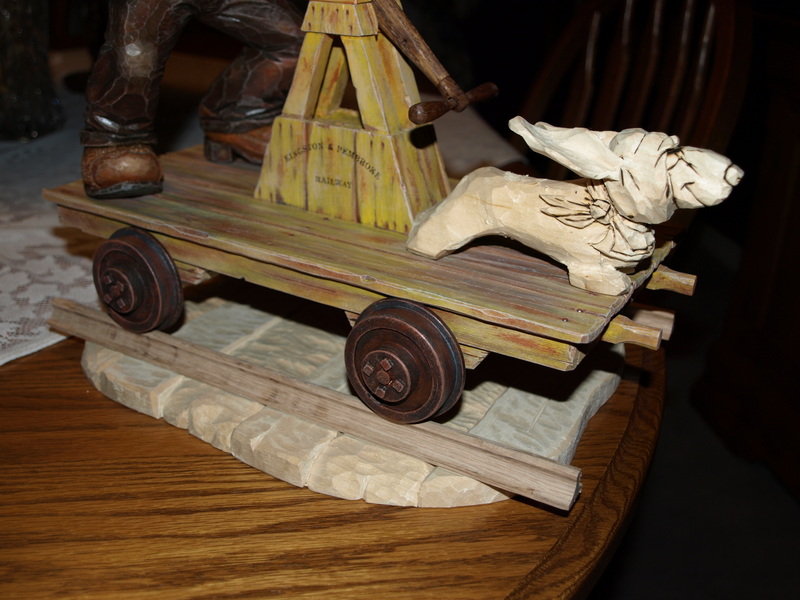 I’m a bit torn on whether to use the oak base beneath the rail base or not…I’m leaning heavily toward the oak base ( today ) as it seems to finish the carving off. I’d appreciate any comments and your point of view on the base. 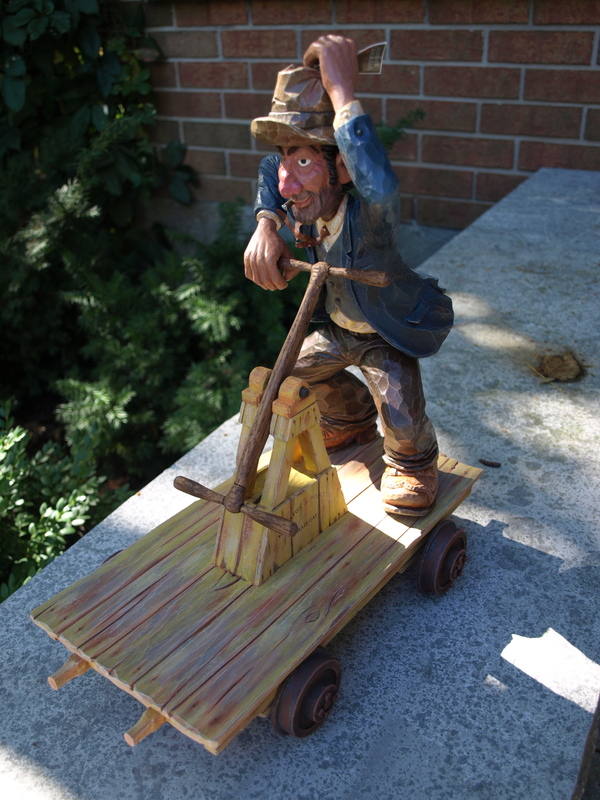 Do you know what a bindle is? I didn’t until a few weeks ago. 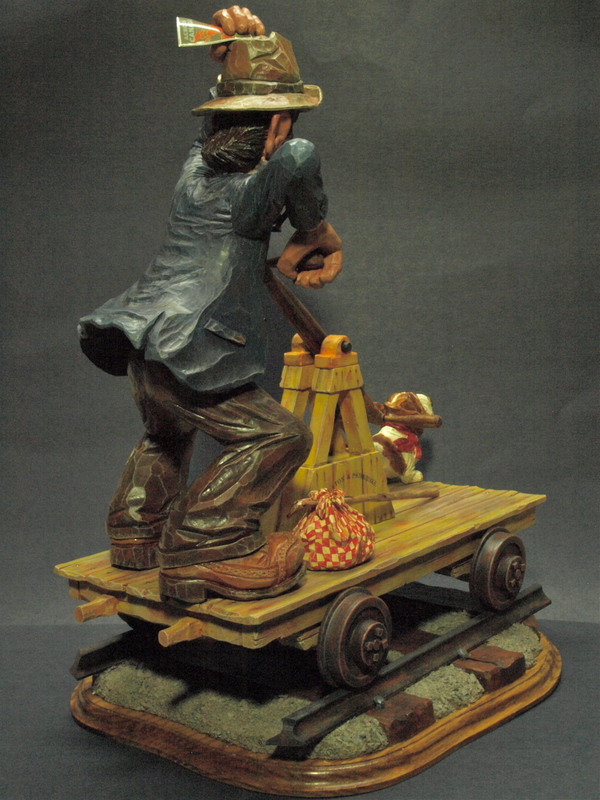 As it turns out, a bindle is the sack or “bundle” that a hobo, in the day, would carry on a stick that he would have found along the way. 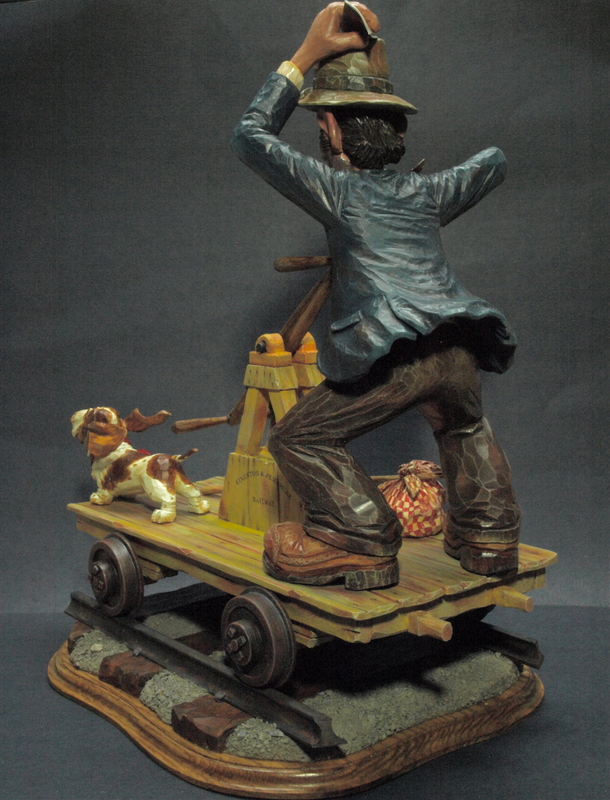 The bindle was no more than about a square yard of material, usually cotton, tied on it’s four corners around the end of the stick. 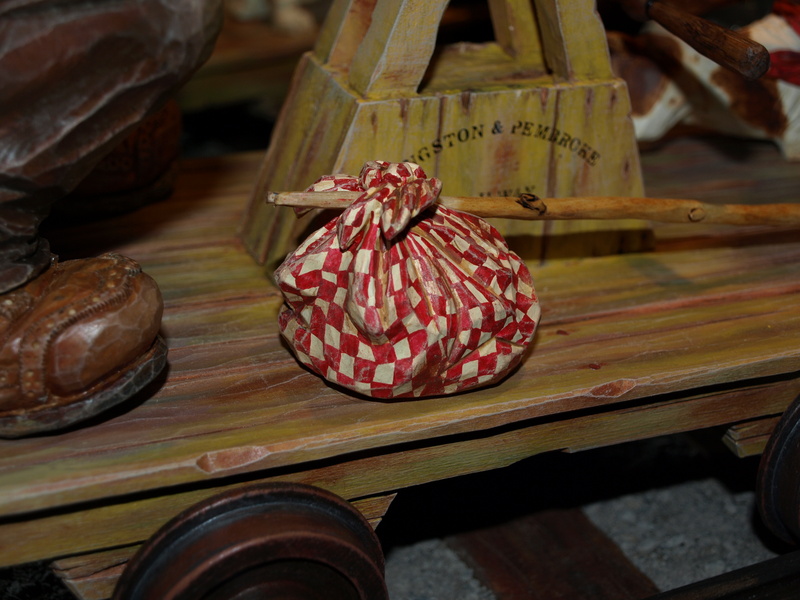 Inside the bindle would be all of the necessities of light travel. 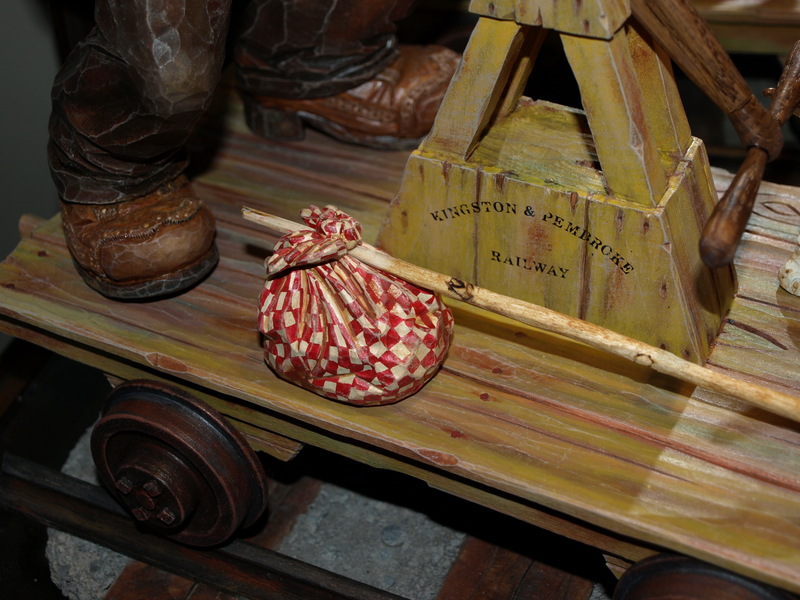 Ned’s bindle is made of basswood and has ample creases and folds along with the four cornered knot. The biggest challenge was painting it…I painted it four times until I got something that made me happy. I think that the checked fabric really lends itself to all of the folds and accentuates them by being stretched in the right places on the fabric and disappearing behind the folds at other places. I added a bit of “dirt” with some browns and yellows and then topped it off with a clear urethane. 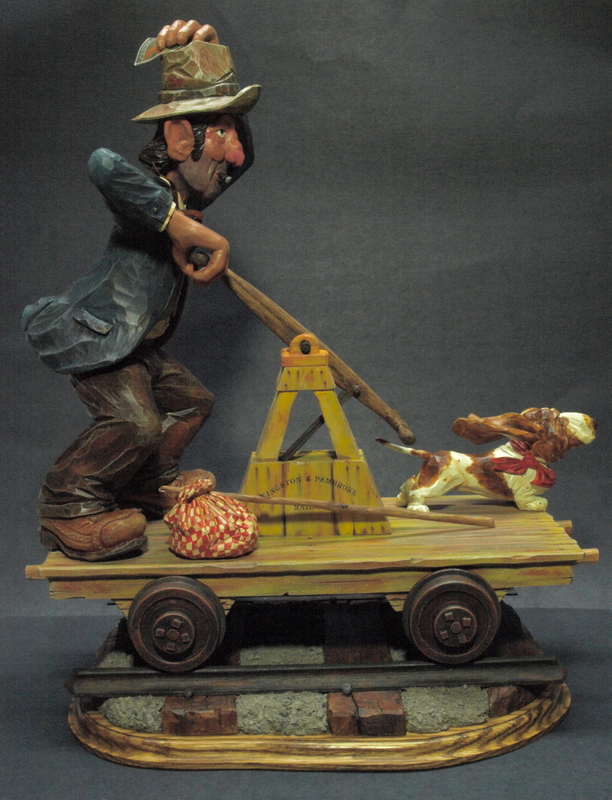 I like to think that Ned’s bindle contains a harmonica that he plays well, a good whittling jack-knife, some apple pie that a kind farmer’s wife left out for him and a few treats for his little dog, Hobo. I’m still working on the walking stick and plan to give it a paint job shortly. Hope you enjoy Ned’s new accessory. The carving is finished on Hobo and short of a few touch ups on the paint, he should be just about ready to join Ned on his high speed rail pump-car. Hobo’s eyes are squinted and his ears are pinned back nicely from the wind in his face. 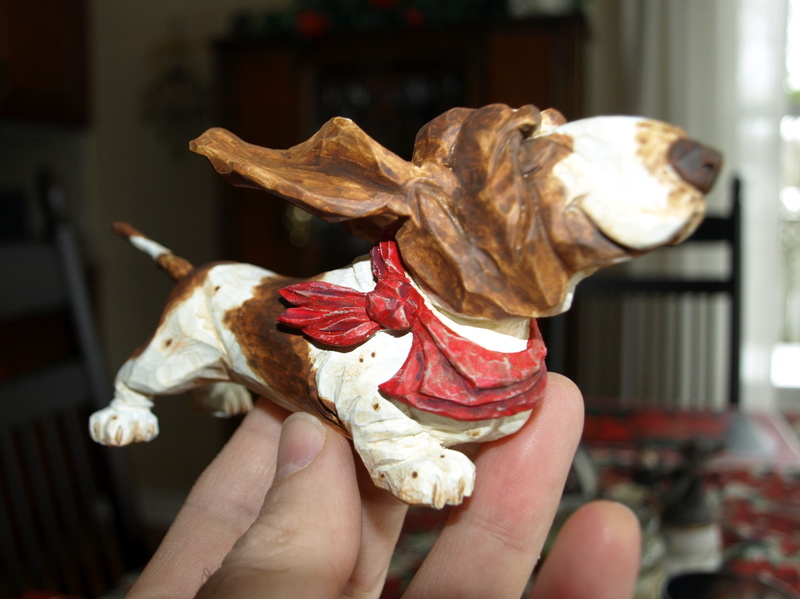 I did my best to give Hobo that Basset-Hound-look of having a little more skin than necessary for his frame. It was interesting carving the folds around his eyes and jowels, and a few extra folds at his ankles. I added in the red “neckerchief” to give him a little extra character…although, he’s quite a character even without it. I’m going to go back and just touch up his toe-nails a bit more as well as the area around his mouth just to accentuate his smile. Other than that, he should be ready for the rail. The base is turning out pretty nicely, as well. 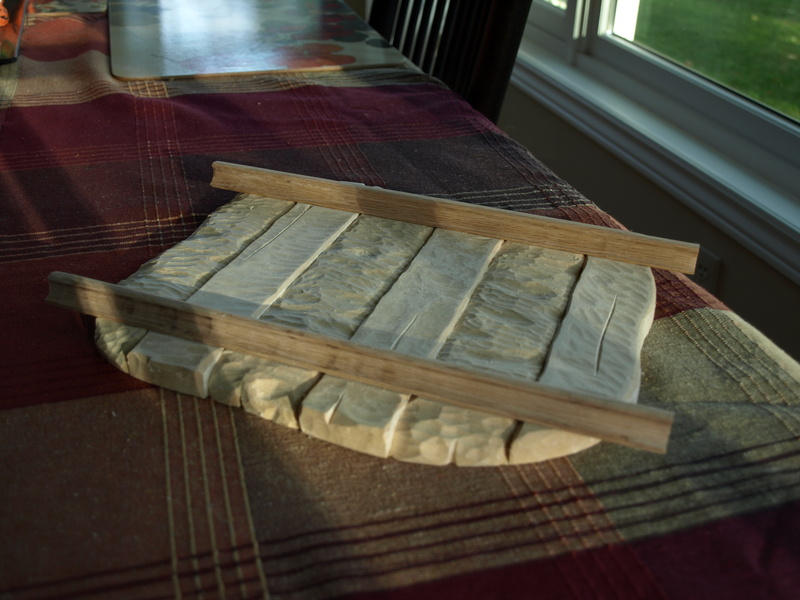 I ended up using some oak to make the rails while the ties and base are basswood. 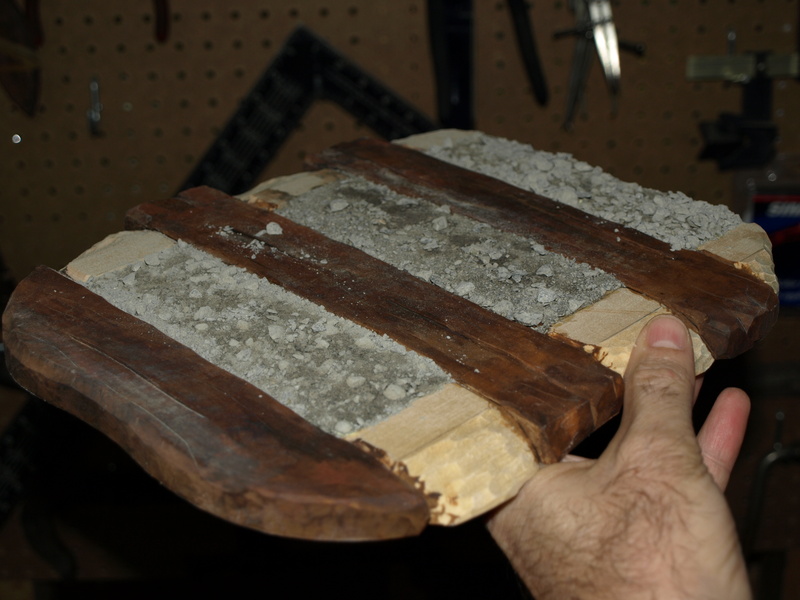 The crushed stone is a polymer that I had in the garage left over from some patio block work that I did earlier this year. I just put a white glue base down and sprinkled the polymer over it. The polymer is also activated/glued with water…so, I sprayed a coat of water over it after everything dried and it ended up rock hard. Hope you like it so far. I’ve painted the ties with a combination of different acrylic browns…asphaltum, burnt umber, raw umber, chocolate…with a few washes of Payne’s Grey through the centre section of the ties to give it some darkness as if years of locomotive oil and debris have landed on it. Once I get the clear coat on it, the different shades will really come out. I applied some white glue to the ballast sections and then sprinkled on some “crushed stone.” Ok, the crushed stone is not quite that. I’ve done some patio block work around the house and I had a bag of the filler that you use between the blocks to set them. This is actually a polymer filler that looks about the same size as limestone screenings that are often used for leveling patio blocks. Anyways, the interesting thing about the polymer is that it sets fairly hard with water. So, once the white glue dries the first layer of “stones” in place, a misting of water sets the upper layers. I found that I did need to add a dab of white glue to any upper larger “rocks” to keep them in place. It’s looking pretty good so far as you can see by that smiling man in the photo. 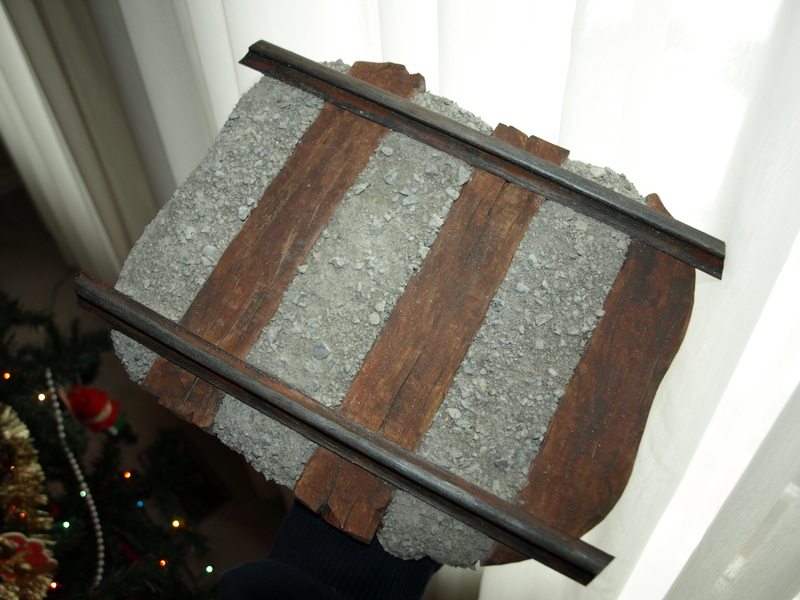 I worked a bit on the ties and ballast that will make up a part of the base for Ned and “Hobo”. 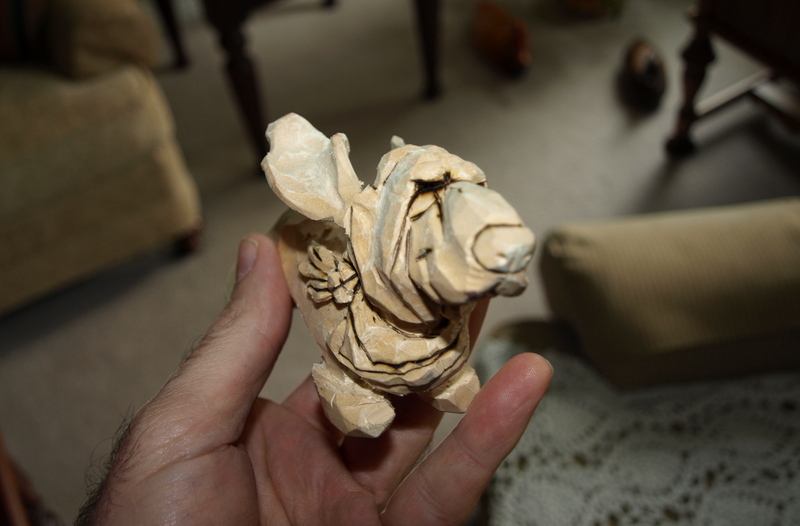 The wood is basswood that I picked up at the Pickering Carving Show. I carved several ties into the basswood and chiseled out some irregular ground between the ties. My plan is to make this ground look like a combination of gravel and dirt with just the right amount of oil and debris to make it look like it’s been well travelled. The rails themselves will be cut to the right lengths once I get the ties completed. 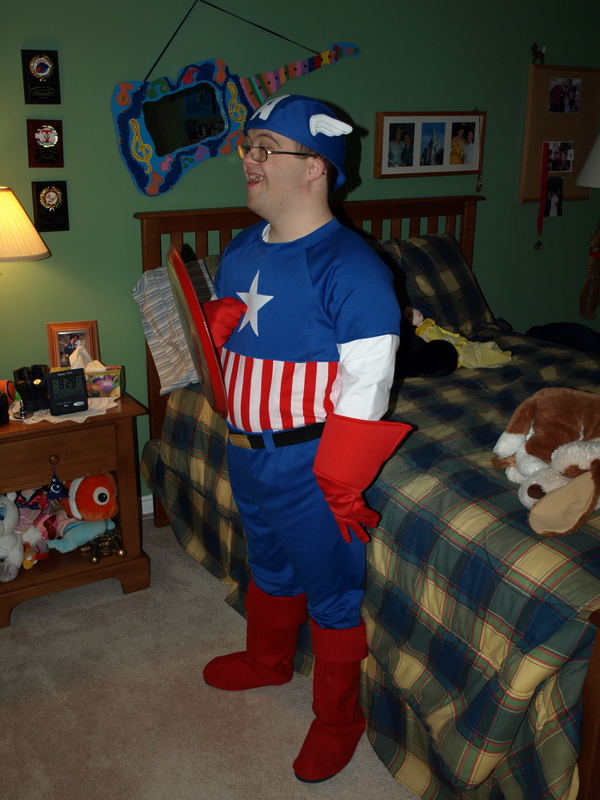 Now, how about Captain America…well, it doesn’t have much to do with carving but it is craft related and features my #1 son, Paul. 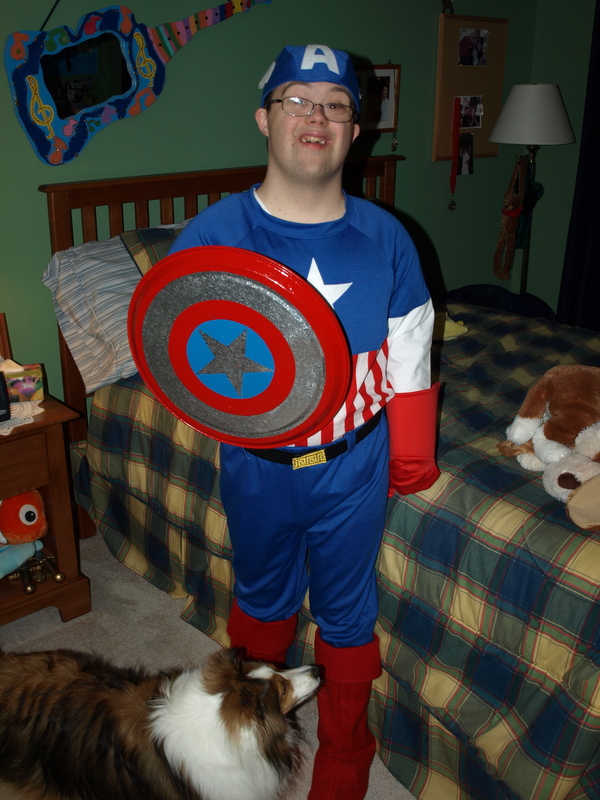 As he decided that he would be Captain America for Hallowe’en, Peggy has been very busy sewing and creating his costume. She did a terrific job and he’s already been the Captain at one party with several more parties to come. 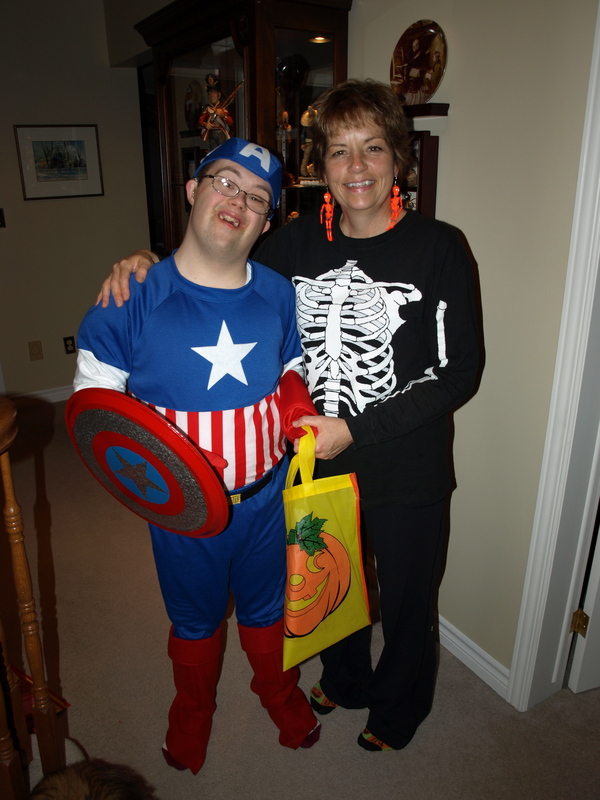 Happy Hallowe’en! 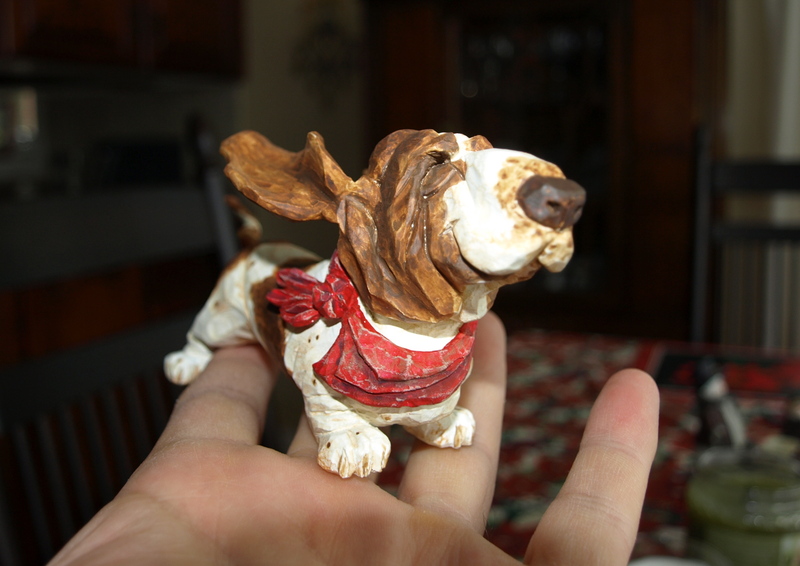 Ned’s Basset Hound is currently under construction. 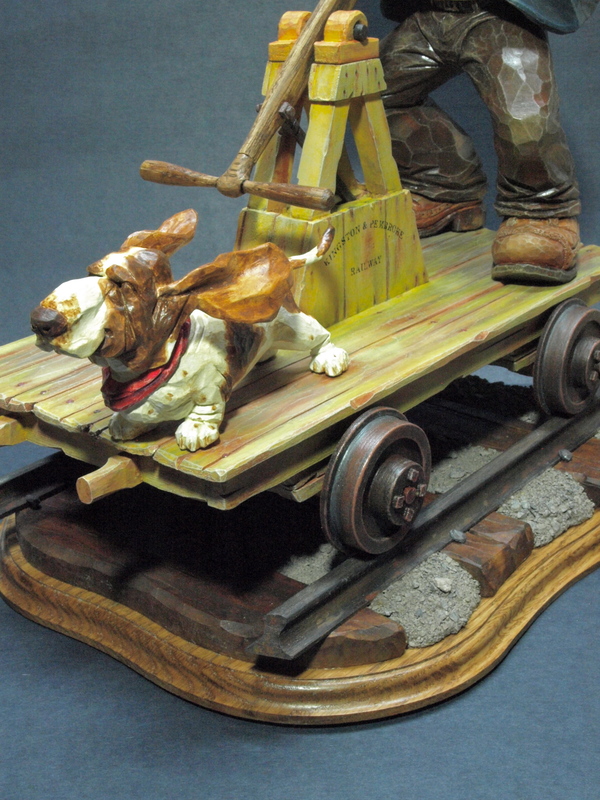 I’m looking for lots of wrinkles, squinted eyes and ears pinned back as Ned and “Hobo” rocket along the rails. Still lots to do, but I’ve got the start to a pretty good little friend for Ned. I actually pondered for some time on a good way to come up with some reasonably looking rails for Ned’s pump-car. 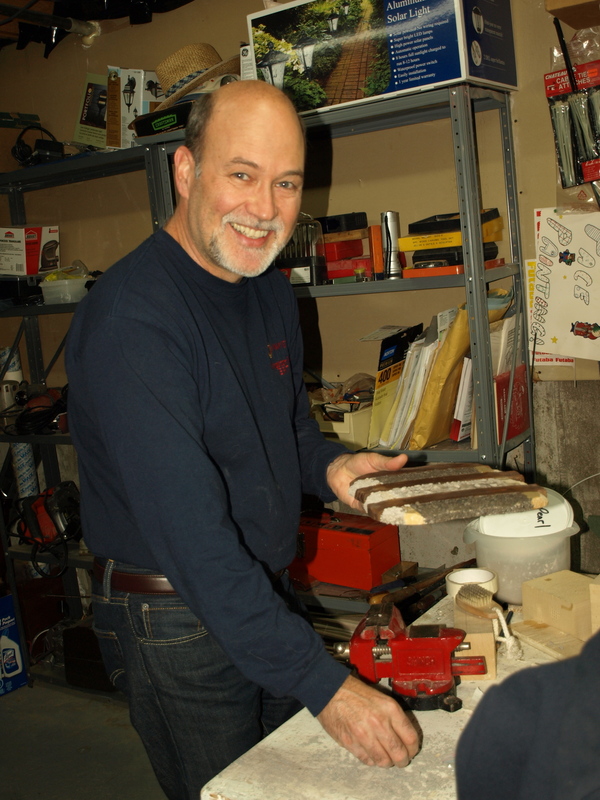 I had some good suggestions given to me along the lines of hobby shop rails, making some castings, etc. As I considered these methods, each was abandoned for one reason or another. 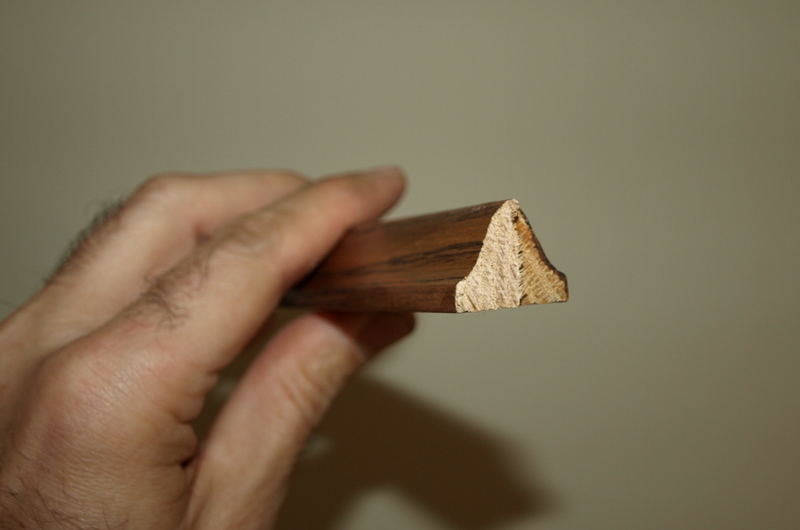 I really didn’t want to start shaping a small piece of wood with chisels and I couldn’t get my head around holding a thin piece of wood up to a router bit safely. At about the same time, I started thinking about approximating the shape of a rail. 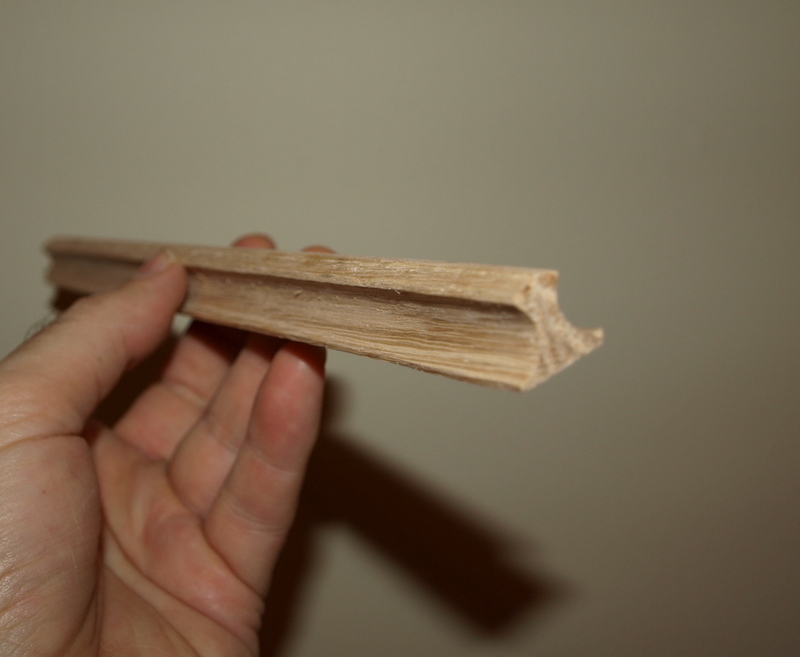 I had put some moulding along our kitchen cabinets a little while ago and when I picked up some scraps that I still had laying around, I realized that if I glued them back-to-back, it started to look a bit like a rail. As it still needed some shaping, I temporarily glued the flat section ( bottom ) of the rail to a larger piece of wood that I could use to hold while routing on the router table and that would keep my fingers well away from the router bit. After a few passes with a couple of router bits, the rail is looking pretty respectable. I little bit of sanding and some shaping and I think that I have the start of a base. The pump-car got a paint job started yesterday. Originally yellow in colour, you can see that it’s been out in the weather for a while ( just like Ned ) and looks a bit worse for wear. The weathering with browns and greys was actually a lot of fun. I’ve started putting some nail holes in the floor boards and will add some rusted-looking nails in a while. Still a bit more to do on the pump car but I did add a weathered looking “Kingston Pembroke Railway” logo on the sides of the pump car. I used old “Letraset” letters ( remember those? ) which are transferred onto the wood with a bit of rubbing. Following that, I took a sharp knife and removed some portions of a few of the letters to make it look weathered as well. The Kingston Pembroke Railway was a line that existed in the late 1800’s up to the mid-1900’s and served a wide area around where I live. Known as the K&P it was often referred to as the “Kick and Push” railway…which might give us a hint as to its reliability at the time. The other fun item that I added, and which is a bit difficult to see in these photos, is a Canadian Pacific brochure from the 1930’s. I found this on the web and reduced it down, printed it on photo paper and backed it up with a small piece of house flashing ( metal ). Ned’s holding it in his left hand. Across the top of the brochure it says ” Across Canada “. A fun little extra touch.